China's top legislature on Thursday approved two new national commemoration days, one to mourn victims of the Nanjing Massacre and the other to mark victory in the War of Resistance against Japanese Aggression (1937-45). September 3 was set as Victory Day and December 13 as Memorial Day for Nanjing Massacre victims. The decision was made at the three-day session of the Standing Committee of the National People's Congress (NPC) which ended on Thursday. The move will remember the harm caused, convey China's stance against aggression, safeguard human dignity and preserve world peace, according to the legislature. The Chinese People's War of Resistance against Japanese Aggression was a just war against Japanese imperialists and was an important part of the World Anti-Fascist War. It was a war of national liberation, the first in modern history in which China won complete victory over foreign aggressors. After the founding of the People's Republic of China, the central government designated September 3, the day after the Japanese government officially signed the surrender document on September 2, 1945, as Victory Day. The NPC's Standing Committee decided to ratify September 3 as Victory Day to keep history firmly in mind, recall the Chinese people's arduous resistance against Japanese aggression, and commemorate heroic martyrs in the war as well as all the people who contributed to the victory, the decision said. The ratification was also aimed at displaying the important role of China's anti-Japanese war in the World Anti-Fascist War, expressing China's firm stance of safeguarding national sovereignty, territorial solidarity and world peace, while carrying forward national spirit with its core of patriotism and inspiring the joint drive to realize the Chinese dream of national rejuvenation. On December 13, 1937, Japanese aggressors began slaughtering residents of Nanjing and continued for more than 40 days. The Nanjing Massacre shocked the world and more than 300,000 people were killed. The country will hold national memorial activities on September 3 and December 13 every year. Tears flowed when Xia Shuqin, a survivor of the Nanjing Massacre, learned that the country plans to set a National Memorial Day for victims like her deceased relatives on Tuesday. "I am very happy as the whole world will know the history of the Nanjing Massacre (through the memorial). I was 8 years old, it hasn't been easy to live past 80 years old now. I want the Japanese government to admit this history," Xia said. Seventy-six years ago, Xia, now 86, witnessed seven family members being killed in the tragedy. She and her younger sister were the only survivors. Similar feelings were shared among some 20 Chinese scholars, survivors and bereaved family members of the Nanjing Massacre, as they gathered for a discussion forum in the Memorial Hall of the Victims of the Nanjing Massacre by Japanese Invaders. "We could mourn for those victims in a wider area and better remember this history," said Zhu Chengshan, the curator of the memorial hall. "Meanwhile, it shows to the world that China is determined to remember history and secure peace." 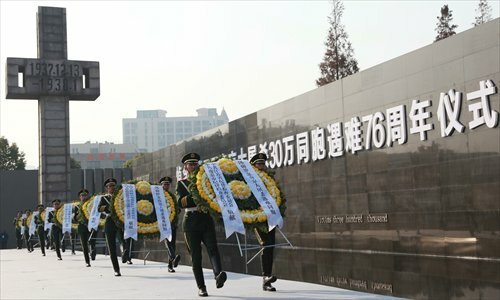 Zhu has been dedicated to promoting the memorial activities to State-level for years. "They (the new memorial days) show China's consideration for human rights and respect for lives," Zhu said. "It is a consolation for the bereaved family members and a comfort for the survivors." "Holding memorials through legislation safeguards the truth of the history of the Nanjing Massacre and has strong historical and practical significance in rejecting right-wing forces in Japan," Zhu added. Xu Kangying, a historian, said the significance of this plan is threefold. "To commemorate the disaster means to secure peace rather than trigger a new war." Similar proposals to establish a national memorial day have been put to the NPC several times. Zou Jianping, a deputy to the congress who raised the proposal in 2012, called the decision a "common aspiration of the people." Similar memorials have been held annually in the Auschwitz Concentration Camp in Poland, Russia's World War II Memorial Stele and the Pearl Harbor Memorial Museum of the United States. Japanese officials quickly reacted to the move. Japan's Chief Cabinet Secretary Yoshihide Suga on Wednesday questioned why China had decided to designate the days now, 69 years after the end of World War II (WWII), according to a report by NHK, a Japanese broadcasting organization. A foreign ministry official on Thursday urged Japanese leaders to face and reflect honestly on Japan's history of aggression, soon after the approval of the two national days. "The approval of the national days has great historical significance and is a necessity in the current circumstances," said the official. "We urge Japanese leaders to face squarely and reflect on Japan's history of aggression with a highly responsible attitude toward history, the people and the future, to correct their mistakes and change their course." Defense Ministry spokesman Yang Yujun also said on Thursday that Japan should face up to and reflect on its history and not make critical comments about China's memorial activities. Yang said that remembering history is not for continuing hatred but for cherishing hard-won peace. "We cannot help wondering why some Japanese officials still attempt to vindicate Japan's war crimes and pay tribute to the war-linked Yasukuni Shrine, which still honors Class-A war criminals of WWII," said Yang. He urged Japan to face up to and reflect on its war responsibility and take concrete actions to win the trust of its Asian neighbors and international society, instead of making carping comments on normal memorial and mourning activities of war-victim countries.